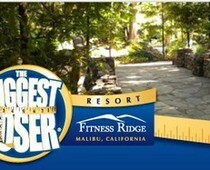 A seven day, six night stay for two at The Biggest Loser Resort at Fitness Ridge in Malibu, CA, where you'll experience the rigorous fitness and weight loss regime, made famous by The Biggest Loser. This includes daily fitness and exercise activities, healthy low calorie meals, relaxing spa services, educational lectures and a private cooking class with the resort’s on-site executive chef. To help stay on track with his/her fitness goals, the winner will also receive a copy of Joy Bauer’s bestselling book, Food Cures, a personalized nutrition program designed by Joy herself, and $175 in SpaWeek Gift Cards to relax body and mind at his/her choice of over 4,000 spas nationwide.